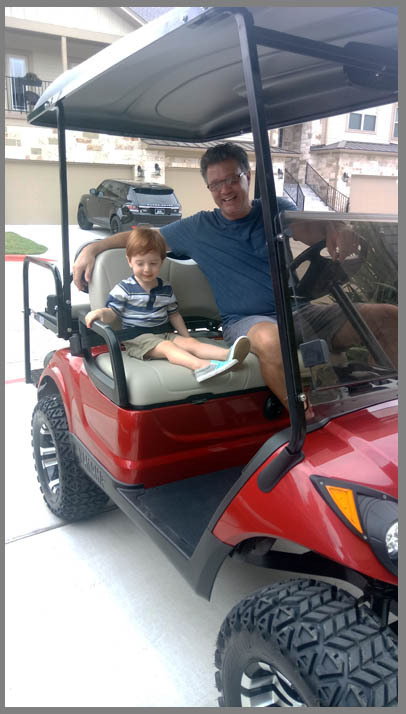 Brian’s new toy arrived just in time for our sons and grandsons to have a blast driving it around the neighborhood last week. It is the perfect vehicle for scooting here and there, hauling kids with wet towels to and from the pool, and simple joy rides. Of course, the grandsons both had a turn driving it, but the big boys had the most fun with it. Since the golf cart had to stay on our neighborhood streets, we always knew they were never too far away. There was only so far they could go. The physical golf cart came with limitations, and I don’t think it’s too much of a stretch to suggest that we, as Christians, put similar limitations on our spiritual lives. 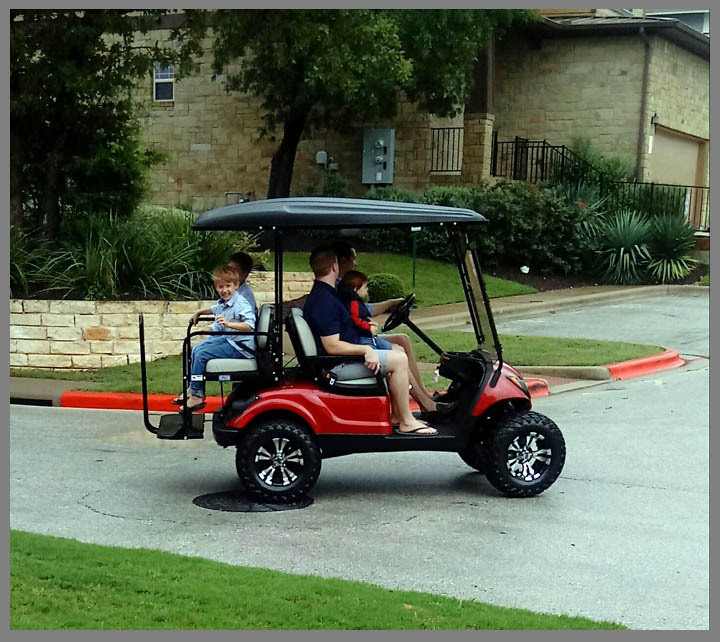 Our golf cart cannot leave the safety of our subdivision; it is not licensed for use on the roads that surround us. Many of us bind our faith to the safety of our comfort zones of knowledge. We stay within the boundaries of what we know and we dare not stray beyond that. We know the Bible stories and the doctrines we were taught as children, we’ve heard a few good sermons along the way, and we are fine with that. We know what we know and we are comfortable to drive within that sphere of knowledge. We will not stray further. This is a reality; the other day I had a conversation with a friend about attending a Bible study this fall. Bible studies are not the preferred way of learning for this person. This person likes discussions, where everyone shares what they know, or perhaps what they don’t know. It’s like driving a bunch of golf carts around in the same neighborhood of understanding, where no one will challenge us, or move us into foreign territory. I disagree with my friend, I believe we desperately need Bible studies. We need teachers who are trained to exposit the Bible for us, who dig deep to understand the context, the culture, and the depth of what God has for us. We need to hitch our little carts to the back of a spiritual BMW and head out on the highway. It is good to grow beyond what we know by learning new things. We have always needed Bible teachers, even in the Old Testament God’s people had instructors. The Levites instructed the people in the Law while the people were standing there. They read from the Book of the Law of God, making it clear and giving the meaning so that the people understood what was being read (Nehemiah 8:7-8 NIV). Another issue with golf cart theology is that we are afraid of what is outside of our neighborhood — outside of our limited understanding and personal experience. I had a conversation recently with a Bible teacher about spiritual warfare and unfortunately, this Bible teacher exhorted me to drive my cart of faith only on familiar streets. There is safety in what we have already experienced and know. Nevertheless, spiritual warfare is a reality and when we engage the battle, lives are set free. And when souls are set free, joy overflows in celebration of the victory of Jesus over darkness. What is it that prevents us from venturing beyond what we are already familiar with? Is it fear that keeps our minds closed? Is it laziness that blocks the road of research? Is it pride that shines a red light on discussion? Are we afraid of the power we might receive when we ask for wisdom? A friend recently invited me to drive my cart into her neighborhood. She believes that her streets are straight streets, and that she has the best view of a theological mountain that divided our neighborhoods. She wanted me to view things from her perspective. Dare I drive my cart out of my comfort zone? I did, and I saw some interesting things. However, I could not move into her neighborhood because there are truths in my neighborhood that I cannot abandon. While my friend is a Christian, she and I see things differently. Just because you or I happen to see the west side of a mountain does not mean there is not an east side. There are times when we must simply agree to disagree. 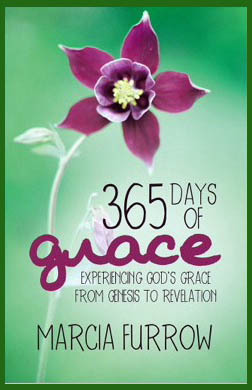 Knowing that each of us will give an account of ourselves to God (Romans 14:12 NIV). I think there may be times when we need to hitch our little carts to excavators and tear down barriers that prevent us from reaching common ground and build connecting roads where we can go back and forth respectfully, rather than trying to pull each other onto our own specific road. The dilemma we face is: How do we know when it is safe to move away from the familiar and into the unfamiliar? What if we find ourselves driving around in false theology so far from truth that we cannot find our way back? The best way to safely drive our faith carts out of our familiar theological territory and expand our understanding of who God is, what his plan for the world is, and how we fit into that plan is to engage in a Bible study where God’s Word is taught. Are you ready to expand your horizon? Where are you studying this fall? Will you open your mind and explore the great expanse of God’s Word? If you are looking for a reputable Bible study, please ask your pastor, or click on the links below for more information.